Epox 4PDA2+ PCSTATS Review - What else is on board? What else is on board? As you can see, the Epox 4PDA2+ is a pretty busy motherboard but the layout is still good. 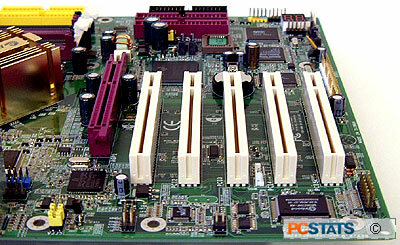 The 4PDA2+ has the main IDE and ATX power connectors placed in their ideal location to the right of the DIMM slots. Sure the ATX12V power connector is to the left of the Northbridge, but with the cable so small it will not affect airflow much. The secondary IDE channels and Floppy drive connectors on the 4PDA2+ are place a bit lower on the motherboard and unless you're using full length PCI cards you won't have any problems. It's also a nice treat to be able to install and remove memory on the 4PDA2+ without having to first remove the videocard. Incidently, the Northbridge heatsink is located far enough from the AGP slot that GPU heatsinks like the like the Zalman ZM-80A HP are installable. Epox have thrown in many features (firewire, SATA, USB, audio, etc.) that you're likely to require, aside from dual BIOS's that is. On a motherboard such as this, there really is no getting around the fact the 4PDA2+ really should have a backup BIOS. One thing I was extremely happy to see was that the 4PDA2+ includes a secondary Serial ATA RAID controller (Silicon Image Sil3112ACT144) in addition to a secondary Ultra/133 IDE RAID controller (HighPoint HPT372). 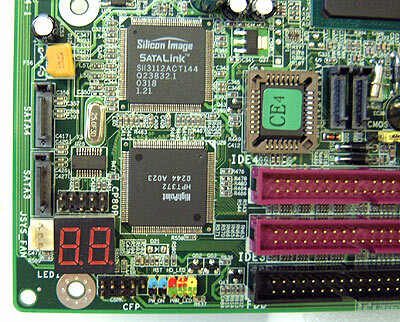 The Silicon Image chipset also accomodates future SATA on ATAPI devices like CROMs, CDR/RW drives and so forth. It seems like manufacturers are really on the push to move everything to Serial ATA, forgetting in this midst of this that that most computers currently in use are still working just fine with IDE hard drives. I for one know that I would not want to buy an additional PCI IDE controller if I were upgrading my motherboard. Just goes to show you that Epox has some pretty good foresight in this arena. One feature on the EPDA2+ that I find very useful is the Port 80 diagnostics card. From memory errors, to videocards and even CPU cache problems, if you're experiencing hardware related issues the Port 80 can be a real lifesaver when it comes to diagnosing the problem. The Intel i965PE Springdale chipset has some very unique technologies built into it, so if you're interested in knowing more I recommend you see this review review where we cover the basics in detail. Pg 2. — What else is on board?